A lounge is not just a place for your employees to take five in, but a good portion of young workers today report that they’d prefer to work in a lounge area. So make yours a good one. 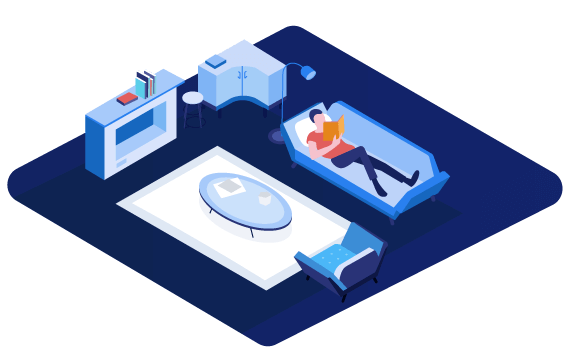 You want to get sofas that are spacious, relaxing, and strong so that your employees can get some quality downtime and come back to work refreshed. Like sofas, the lounge’s seats should give your employees a break from their task chairs and provide the potential for coffee and conversations. Place a big coffee table in the center of your lounge’s seating area so that your employees have a convenient place to put their devices down and take a break. For the more office-wide items like decorations, snacks, and coffee machine refills, place enough shelves to give your lounge ample storage space. Give your employees’ favorite room a trendy, chic, and relaxing vibe so that they can come back to their desks fully recharged. Add plants, wall art, and other decorations.